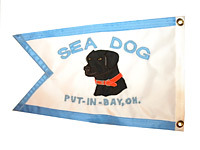 Let us design your personalized flag for boats, schools, golf courses, retail stores or any other display application. See price list below. 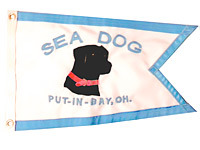 Our custom flags are made with heavy weight 400 denier nylon and sewn applique style for depth and detail. 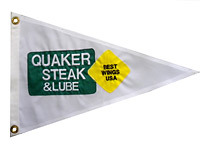 Our flags are hand sewn with 100% polyester thread to provide extra strength and protection against UV rays. 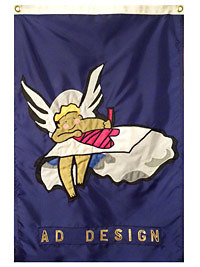 Send us your artwork or let us help you design a flag to meet your needs. There is a one time setup fee of $65.00. The additional cost would be dependent on the complexity of the flag. Basic Flag prices for lettering and a simple sillouhette are listed below.